Read the invigorating and highly quotable introduction as well as chapter 1 and stop there if you’re in a hurry. By implementing sweeping changes, businesses often think it’s possible to do better, to earn more, and have happier employees. So why does engagement prove so difficult and productivity so elusive? In Beyond Measure, Margaret Heffernan looks back over her decades spent overseeing different organizations and comes to a counterintuitive conclusion: it’s the small shifts that have the greatest impact. 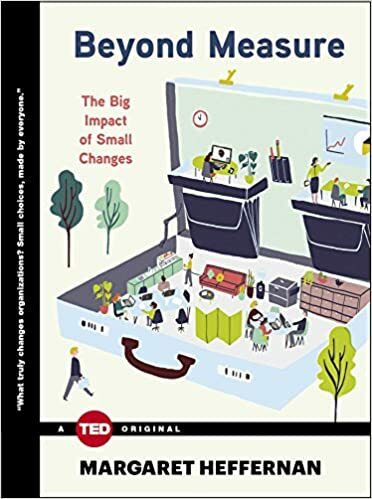 Heffernan argues that building the strongest organization can be accelerated by implementing seemingly small changes, such as embracing conflict as a creative catalyst; using every mind on the team; celebrating mistakes; speaking up and listening more; and encouraging time off from work. Packed with incredible anecdotes and startling statistics, Beyond Measure takes us on a fascinating tour across the globe, highlighting disparate businesses and revealing how they’ve managed to change themselves in big ways through incremental shifts. How did the CIA revolutionize their intelligence gathering with one simple question? How did one organization increase their revenue by $15 million by instituting a short coffee break? How can a day-long hackathon change the culture of a company? Told with wry wit and knowing humor, Heffernan proves that it’s often the small changes that make the greatest, most lasting impact. You really want to read the overviewing introduction and chapter 1 about creative conflict, while the rest of the book simply fails to delivery what’s promised in the title. The problem is that, the title promises small, actionable changes for big impact. But, dude, those that are actually suggested in the book are definitely not small ones: teaching empathy, smashing silos, introducing divergent thinking, making offsites work, forgetting ranking, distributing power, letting the best idea lead, … what’s next, ending war, poverty and saving the world? And those are small changes and small shifts? All are great points, but I just really can’t see how those changes are small. In other words, the author failed to touch the ground of small changes and simply chose to float in the middle, making a bunch of really good points that can NOT provoke your thoughts on the actionables. Ambitious, but falls shallow. Despite all that, the sobering opinions in the introduction and chapter 1 are worth your careful read. Call it comfort food if you want, but it’s not without subtleties. We measure everything at work except what counts. Numbers are comforting… and create an illusion of control. But when we’re confronted by spectacular success or failure, everyone from the CEO to the janitor points in the same direction: the culture. Beyond measure and sometimes apparently beyond comprehension, culture has become the secret sauce of organizational life: the thing that makes the difference but for which no one has the recipe. The paradox of organizational culture lies in the fact that, while it makes a big difference, it is comprised of small actions, habits, and choices. The accumulation of these behaviors- coming from everywhere, from the top and the bottom of the hierarchy, from inside and outside of the company itself- creates an organization’s culture. We may not be able to measure culture but we can measure the high rate of failure for programs aiming at culture change; that stands at around 70 percent. So the idea emerges that culture is elusive, hard to manage, impossible to command. Just cultures tap the ingenuity, initiative, and sheer cleverness of every single individual; they reward imagination and celebrate truth-telling. They recognize that, while the road to success is littered with mistakes, it matters more to build trust and encourage ambition than to reward obedience. At the heart of any robust culture is an idea of leadership that isn’t about second-guessing- markets, shareholders, stakeholders, bosses, and peers- but having the courage to think and speak for oneself and on behalf of others. [Just cultures] are inherently democratic, demanding a generous and humble mindset. If there is a single diagnostic indicator of a healthy workplace, it may just be the quality of connectedness and the ease of idea flow that characterizes them. In just cultures, every single person counts. As Randy Papadellis, the CEO of Ocean Spray put it, nobody wins unless everyone wins. Passivity, articulated through silence, exacts a price not just when people feel they can’t warn others about problems but also when they feel they can’t challenge and explore new ideas. It’s in that silence that opportunities- for redress or innovation- vanish. …conflict aversion and a desire to please are universal, eviscerating our energy, initiative, and our courage. …just cultures aim specifically at ensuring that conflict and ideas come out where they can be seen, explored, and confronted safely. The purpose of a just culture is to surface all the information, intelligence, and insight required to make the best decisions. Truly creative conflict requires a complex array of personalities, backgrounds, thinking styles, and attitudes. But there are good reasons why this often does not happen. We are all biased. Great thinking partners aren’t echo chambers– they bring well-stocked minds, new perspective, and challenge. Great teams need windows on the world, but biases mean that we mostly get mirrors. Questions are the heart and soul of constructive conflict. They open up the exploration, bring in new information, and reframe debate. Who needs to benefit from our decision? How? What else would we need to know to be more confident of this decision? Who are the people affected by this decision; who have the least power to influence it? How much of this decision must we make today? Why is this important? And what’s important about that? If we had infinite resources- time, money, people- what would we do? What would we do if we had none? What are all the reasons this is the right decision? What are all the reasons it is the wrong decision? Most organizations pay lip service to the importance of mistakes- but few people believe it’s safe to talk about them. In one recent study, of those questioned, 88 percent said they would address mistakes only in private; just 4 percent were willing to do so openly in front of others.